If your roof is old and has sustained major damage from the elements, then a replacement may be your best option. Roof repairs are only advisable for minor issues, such as some cracks or holes. You may need to choose the replacement immediately, though, as delaying it might lead to more expenses. As your roof is one of your biggest investments, you need to take on your project with complete certainty. 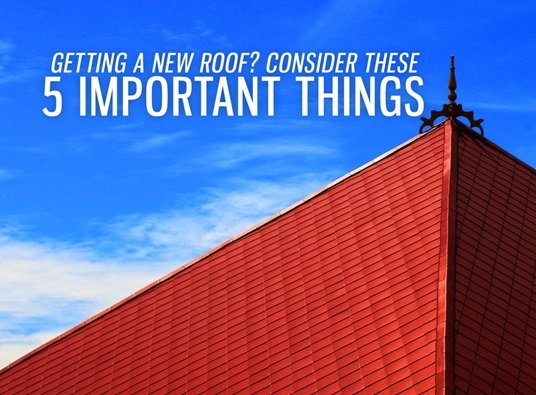 Rogers Roofing, the leading roofer in Chicago and the local area, lists the five things to consider prior to installing a new roof. Roofing material to use – With the numerous options you have today, your choice will probably depend on your budget and preference. We offer concrete tiles that can withstand even the harshest winds and storms. They can provide an efficient protection for your home for a long time. Our asphalt shingles, on the other hand, can boost your home’s curb appeal because of their superior beauty. Although more economical than other materials, our shingles can perform up to standards. Color combination – The right color scheme provides more than just aesthetic appeal for your roofing in Schererville, IN. It can also make a difference in your home’s energy efficiency. Darker shades absorb more solar heat than lighter shades, which will be helpful during cold months. Professional installation – The efficiency of your roof usually depends on the manner of installation. As one of the most trusted roofing companies in Northwest Indiana, we can help you with this. Rogers Roofing has nearly 50 years of experience in the industry; rest assured we can install your new roof in the most professional way possible. Inconvenience to your family and neighbors – The hammering and stripping can cause a lot of noise in your area. Before you get started with the replacement, it’s best to check with your family and neighbors, and inform them about the work schedule. Terms of contract – Get a written contract from your contractor before the project begins. This way, you’ll be able to understand all the details. Rogers Roofing always provides a written contract to our clients, so we could agree on any changes before the job takes place. Rogers Roofing can guarantee a smooth and hassle-free replacement process. With us, you’ll only get quality materials and reliable services. Our warranty options can cover both our materials and workmanship, ensuring your protection all the way. For more information about our products, call us or fill out our request form today.